There’s no weeknight dinner more comforting than creamy, cheesy carbonara. 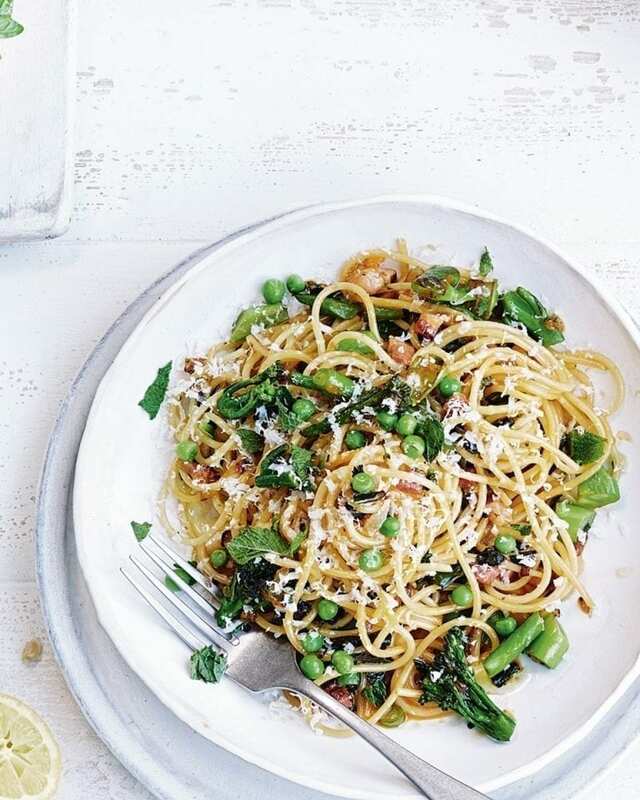 We’ve added fresh mint, peas and broccoli to give this Italian classic a summery twist. Cook the spaghetti in a large pan of boiling water for 10 minutes or until al dente. Drain, then drizzle with extra-virgin olive oil. Meanwhile, in a large frying pan, heat a glug of olive oil and fry the onion over a medium heat for 5-8 minutes until softening. Add the pancetta lardons and broccoli; fry for 5 minutes or until the pancetta is crisp. Add the peas to the pancetta pan and cook for 2 minutes, then turn off the heat. Add the still-hot pasta with another glug of extra-virgin olive oil and toss. Leave for 1 minute. Beat 4 whole eggs with 2 egg yolks, then stir into the pasta with the chopped fresh mint. Taste, season, then serve straightaway with freshly grated parmesan and a squeeze of lemon juice.